Author’s note: this is the second of a three-part article on Clive Beadon, one of the most colourful British dowsers of the last century, for publication in Rod & Pendulum, the bi-monthly newsletter of West Midland Dowsers and Northamptonshire Dowsers. The first part dealt with Beadon’s adventurous career as a professional pilot before, during and after WW2, when he would practise his dowsing blind from deep in the bowels of the aircraft and tell his co-pilot what natural features such as rivers were coming up, then his post-war career as a dowser, particularly in Portugal, where he took up the profession of water diviner with considerable success, having had intensive lessons from the then Secretary of the BSD, Bernard Smithett and his wife Enid. As his scope widened his dowsing started to throw up other things. These are the subject of this second part. Many professional dowsers are so tightly focused on pure drinking water that they will not allow their mind to be “polluted” by anything else. Clive Beadon, however, was gifted with a more enquiring intelligence and began to follow up the unexpected reactions he started to experience when locating sites for well drilling. These reactions consisted of detecting lines which resembled those characteristic of the water he was seeking. Unlike the latter, however, they did not necessarily carry water information such as depth and flow. Because of their linearity they were referred to as “leylines” or just “leys”, a misuse of language which was to cause (and still does) confusion. True leylines were the invention of Alfred Watkins in his The Old Straight Track 1 and other books. These were seen as actual routes across the landscape rather than lines of energy although, as time went on, they started to resemble lines of energy rather than physical tracks. To confuse matters more, Beadon often refers to his leylines as “power lines”, with nothing to do with the National Grid! “My recognition of a Ley is by its serial number in the first instance, also its composition and colour, and finally its behaviour. I have a serial identification number of 3 for a true or splintered Ley, the colour make-up being dependent on its purpose, black, white or red, or a composition of several colours including violet and blue.. This does not exclude the whole range of colours, only that so far I have had experience of those mentioned. Greys, yellows and greens may have been noted by others”. Beadon once demonstrated to me his method of dowsing the colour of a leyline. You hold a Mager rosette in your hand, with your fourth finger pressing on the colour segment you are testing for, at the same time holding the rod with the thumb and fingers. By scanning an energy line from side to side it is possible to discriminate between the different colour responses and build up a picture of its structure, thus enabling you to recognise it among a crowd of lines. I have found this a most illuminating technique whereas I cannot get on at all with “serial numbers”. While Beadon discriminated between energy lines and the “flow lines” associated with water, he found that in some circumstances a “ley” can carry along with it information picked up from some watercourse elsewhere. He conjectured that the ley had probably travelled along the length of some underground flow and acquired the knowledge for itself. “Leys have a purpose and while we may disperse the influence of noxious flows (of water) with good intent, the destruction of a ley is a different matter. The ley has therefore to be separated from its spurious information, recognised for what it is and routed round or over the property”. “Many leys have a two-directional flow based on a 12-hour ebb and flow pattern. A blocking mechanism placed on a ley may be effective for only that part of the twelve hour cycle and, to complicate matters further, the return flow track can lie well to one side of the currently observed flow line and possess an entirely different set of characteristics”. Beadon notes that many dowsers have found their first leys by visiting churches of some antiquity and have been surprised at how often power lines seem to traverse the church, forming a cross orientated on north/south and centred on the altar. He cites the now ruined Fountains Abbey in Yorkshire. To his eye, the east-west ley lies like a red carpet 10 ft wide with black stripes near the edge, running the width of the central nave to bisect the altar foundations. He describes the combinations of lines of different colours traversing the length and breadth of the abbey in profusion. “While the colour construction of the lines I find quite remarkable, I am no less amazed by the accuracy of the designers of the leys, who engineered this extraordinary work to get these four leys to cross at a single point”. He compares this with a visit to Brigham Young’s Church of the Latter Day Saints, Salt Lake City. Young decided that their long pilgrimage should stop there and no-one really knows why he chose such an inhospitable area. Beadon’s curiosity was rewarded by finding that an exactly similar pattern of power lines crossed through this beautiful edifice. Even the colours and widths of the leys appeared to be similar. Did Brigham Young perceive the lie and set of four powerful leys and understand from their orientation some important mystery of which we are ignorant? Or did he create through knowledge acquired elsewhere the lines which cross so perfectly in this singular religious sanctuary? “Fountains Abbey was constructed in the eleventh century, the Mormon cathedral in the nineteenth. There is no similarity between the form of the two buildings, one a ruined shell, the other an elegant and beautiful building. Yet they are linked in some way. A strange unseen power haunts each site”. During these years Beadon was living with the resurgence of interest in “earth mysteries” generated by new accounts of Watkins’ work, studies by Francis Hitching, John Michell and the work of Lockyer on the significance of ancient monuments. Their writings indicated a firm conviction that a matrix of lines existed all over our countryside, joining places of significance to some ancient authority but which had become forgotten or overlooked. In some cases they had become inimical to health, hence an increasing interest in “deraying” , cleansing and blocking. “The lines that were now created man added to nature’s matrix. Some added to, and some detracted from, the potency of the originals. 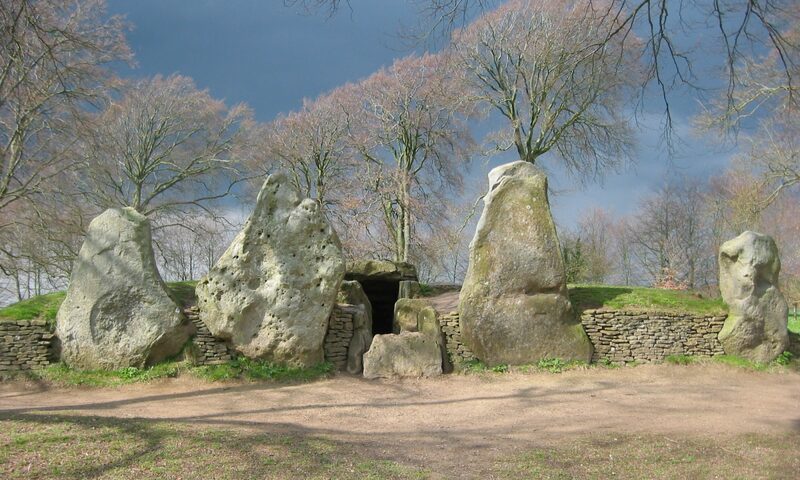 Using his knowledge, he made his lines to connect mediation points previously unconnected, beaming the resultant rays through other marker stones, where their direction could be changed towards and ultimate destination at some stone circle. The power points had been used as meditation centres; thus he had created an embryo communications network, bringing information into the circle from the four corners of his world. Yes, and probably from other networks overseas since there seems to be little dispersion of power on account of distance. And at the centre of the main circle – and in this fantasy I imagine more than one circle – could be found the Director of Conscious Thought – a mystic leader, father figure, the law maker, the source of Power. Since it appears today that many leys have a time clock ebb and flow on a twelve hour cycle, the power lines brought information to the centre and thought waves flowed outwards as the cycle reversed. For that period of time the Directors were in control of the whole system of thought to the listening seekers”. He goes on to invoke the Directors of Astronomy and “others in the inner hierarchy of the management of the Great Circles”. This observation led him to devise increasingly complex devices with which to deal with the energies of the place. Ironically, however, they did not always result in peace and tranquillity for him! This will be the subject of Part Three. This article first appeared in “Rod and Pendulum”, the newsletter of the West Midland and Northamptonshire Dowsers.